This match will go down as one of the biggest results in Annan Athletic’s history after they upset all the odds to record a comfortable 4-1 victory over Premier League side Hamilton Academicals in the fourth round of the William Hill Scottish Cup. It was an incredible result for Annan and the shock result of the fourth round which will long go down in the history of the Galabank side against a team three leagues above them. Annan had progressed to this fourth round tie following victories over Berwick Rangers and Inverurie Locos after a replay but on reflection this surprisingly turned out to be their most comfortable victory to date in this seasons William Hill Cup. Annan started the match without the injured Steven Swinglehurst, Bryan Gillfillan and with David Ferguson’s loan spell finished, manager Jim Chapman had to ring in the changes with Watson partnering Black at the centre of the Annan defence and Ryan McStay being given a rare starting opportunity in the midfield and with Weatherson winning his appeal against the red card handed out in the Clyde match it was a potent Annan attack with Weatherson and Todd up front. It was a wet dreich day and Annan got off to the best possible start when after only six minutes the Galabank side stunned the Accies when Josh Todd unlocked the Hamilton defence to thread the ball into the path of Matty Flynn who slipped the ball past the advancing Michael McGovern to finish with a well directed shot from 9 yards to give Annan an early advantage. Hamilton responded well after this set back when Brophy came close in the 10th minute with a shot on the turn form the edge of the box. Weatherson almost caught the visitors on the 13th minute when a long penetrating ball set the Annan striker in on goal but his poorly hit shot never really tested McGovern. Crawford was presented with an opportunity when Hamilton were awarded a free kick 28 yards out but his fiercely driven shot failed to hit the target going narrowly over the bar. A minute later and Annan carved open another opening when Watson headed a Finnie free kick into the path of Weatherson who was denied by a good save from McGovern. Hamilton forced a few corners and Devlin came close in the 20th minute when he connected with Crawford’s corner but minutes later Todd squandered a glorious opportunity to double Annan’s lead when he won his way into a great position only to finish with a shot past the post when one on one with the keeper. It was a real let off for the Accies. However Hamilton responded well and it took a superb instinctive save from Hart to deny Brophy on the half hour mark and minutes later Greg Docherty tried his luck with a low shot which flashed past the post. As the game approached half time Devlin once again headed over the bar under pressure from a Crawford corner and at the other end Weatherson’s curling shot tested McGovern. Annan started the second half in the same vein as they started the first and within 2 minutes they doubled their lead with a superbly worked goal. Finnie did well to win the ball in his own half before surging forward finishing with a pass to Todd who laid the ball into Weatherson and Todd made the space into the box to receive the ball from Weatherson and finish clinically with a low shot into the corner of the net which sent the Annan fans into dream land. It was a superbly worked goal which cut open the Accies defence. Hart then pulled off two saves to deny Eamon Brophy and the same player went close again in the 60th minute when his shot beat Hart but went narrowly past the post. It was a warning to Annan as Hamilton went all out to get back into the game and minutes later they struck gold when Eamon Brophy chested the ball into the path of Greg Docherty and his low shot swept into the corner of the net. 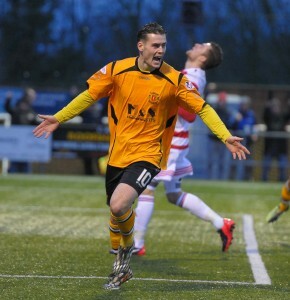 Hamilton were back in the game but within a minute Annan restored their two goal advantage. It was a goal that Hamilton will want to forget after Gordon and Devlin made a mess of a throw in the left hand corner and Todd picked up the lose ball to finish with an instinctive shot which the keeper could only smother with his legs and Rabin Omar reacted quickest to slip the ball into the net from 8 yards to restore Annan’s two goal advantage. Annan continued to press forward and in the 68th minute Weatherson’s well struck free kick was saved by McGovern and Todd following up struck the post from close range. Hamilton’s woes continued and in the 71st minute their fans had to endure another horrible moment when Ryan Finnie’s free kick was chested down by Carlton Morris on the edge of the box but once again Rabin Omar showed his value to the Annan team when he beat Mackinnon to the lose ball to finish with a dink over the keeper and into the empty net from the corner of the 6 yard box. We don’t know how manager Jim Chapman instructed his players to approach this game but it was a match where his team excelled in every department and this result must go down as his greatest achievement in the three short years to the day since he took over at the helm at Annan. On the other hand it must have been a huge disappointment for Hamilton boss Martin Canning in trying to defend his teams performance which lacked the composure and quality to penetrate a resolute Annan defence and who defensively appeared to be unable to cope with Annan’s attacking flair who managed to open them up at ease. This victory however brings other challenges to Annan and although the Cup is a welcome distraction, for the both the fans and the players, Annan’s main thrust this season is to try and achieve promotion and already they have mid week games against Berwick and Queens Park stacking up and their place in the fifth round for the first time in their history on the 6th February means that they will now have another mid week match against Clyde to fit in. All in all it is going to be a busy second half of the season for Annan and it will be interesting to see how they cope with the demands. ANNAN ATHLETIC – Jordan Hart, Steven Black, Steven Sloan , Martin Mcniff, Peter Watson, Ryan McStay ( Smart Osadolor 67 min), Ryan Finnie, Matty Flynn (Liam Par k 89 min), Peter Weatherson (Greig Macdonald 86 min), Josh Todd, Rabin Omar. Subs not used Blair Currie, Stuart McColm, Scott Norman. Referee – Barry Cook. Assistants – Alisdair Ross and David Roome .